As a business owner like many of you, I am very interested in new technology that helps provide better care for our patients. Sometimes the decision to adopt a new method or purchase a new instrument is easy, but in other instances the choice is less clear. I am sure you have wrestled with assessments made more complex by peer pressure and pressure from the industry. I find myself in that position now. In the world of ophthalmology, few topics are receiving more discussion than femtosecond laser-assisted cataract surgery. For several years, I have closely followed development of this technology. It is not without controversy. Supporters feel patients will receive better outcomes with fewer complications. But many surgeons are concerned with the financial costs and are waiting for unbiased evidence of significant patient benefit. At this point, I am in the second camp. I very much appreciate and rely on ophthalmic lasers. 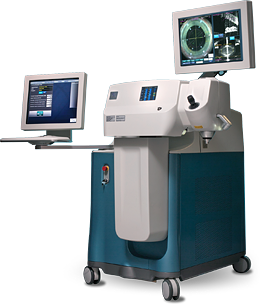 In the early years of my career, I built a YAG laser and over the past decade have been intimately involved with highly skilled hardware and software engineers to help improve the performance and patient outcomes of several sophisticated instruments. But performance and a machine’s capabilities sometimes have to be balanced with economics and what is right for the patient. With this in mind, I will review my current thoughts on laser-assisted cataract surgery—although they certainly could change. Femtosecond lasers create a series of minute, contiguous cavitations (adjoining bubbles) within clear tissue that can be shaped to form an incision. The first step enables users to term treatment as “bladeless cataract surgery”. This marketing advantage may be valuable to surgeons who advertise, but the last three steps are generally those that enthusiasts argue are superior to conventional surgery. Let us briefly review them and examine current evidence. The laser can partially soften or fragment some cataractous lenses. It does not eliminate the need for traditional phacoemulsification (phaco) but rather reduces the amount of ultrasound energy needed. However, mechanical fragmentation can be done more simply by various cracking and chopping techniques. Furthermore, femtosecond laser energy cannot penetrate brunescent cataracts—those most in need of pre-softening and fragmenting. Laser proponents claim softening and partial lens fragmentation is beneficial for patients at risk of irreversible corneal edema after cataract surgery. But conclusive evidence is lacking. One study showed laser-assisted cataract surgery patients had less corneal edema one day post-op than those who received conventional phaco. However, the variance was temporary—there was no statistically significant difference at one week and one month. Results of studies on these issues must be viewed with skepticism because there is no way to do a “double-blind” study. It is impossible to control for surgeon bias. While it makes sense that less phaco energy would be beneficial, we do not know the practical impact of adding laser energy to the procedure, particularly for patients at highest risk for long-term corneal edema. More data is needed. What we do know is that modern viscoelastics, corneal imaging and careful phaco techniques have greatly reduced the incidence of edema in patients with both healthy and diseased corneas. Over the years, limbal relaxing incisions (LRIs) have been used to reduce astigmatism in cataract and refractive surgery with mixed results. Proponents of laser-assisted cataract surgery claim that LRIs are more precisely made by laser than freehand. While this is probably true, what is the practical benefit? The laser’s ability to create precise incisions has not yet been proven to result in more accurate corrections. Varying LRI outcomes may be the result of individual differences in corneal elasticity and healing response—not incision accuracy. The fact is, many surgeons have moved away from LRIs and are utilizing toric IOLs to correct astigmatism. These lenses consistently provide high-quality outcomes, even with higher amounts of astigmatism. When toric IOLs are not the best option, we can correct astigmatism with staged treatment—cataract surgery followed by laser vision correction. Reverting back to LRIs (even if done with a laser) as the primary means of correcting astigmatism has to be viewed with skepticism. A significant number of patients who can have conventional cataract surgery are poor candidates for laser-assisted surgery. This includes those with tremors, small palpebral apertures, deep-set eyes and corneal scars and opacities. Also, laser-assisted cataract surgery is limited to patients whose pupils dilate to at least 7 or 8mm. In addition, deeply brunescent, posterior subcapsular and traumatic cataracts, as well as those with pseudoexfoliation, are better treated with conventional surgery. Medicare does not reimburse extra for cataract surgery steps performed by a $400,000 femtosecond laser. Additional costs include laser service contracts up to $50,000 per year and user fees averaging $500 per case that must be paid to the laser manufacturer. Surgeons are not allowed to charge extra for services Medicare covers. Extra fees can only be billed for LRIs—the refractive component of the cataract procedure. Many surgeons are questioning if it is cost-effective and appropriate to charge for a laser LRI. In a recent article published in the British ophthalmology journal Eye, the authors shared their finding of an exhaustive literature search on laser-assisted cataract surgery. Their review of articles and scientific papers lead them to write that “Femtosecond laser-assisted cataract surgery may allow less-experienced surgeons to obtain better results, but may fail to demonstrate improvement for experienced cataract surgeons…”2 Experience builds skill and reduces complication rates and at PCLI we have the opportunity to do a high volume of surgery. Our individual surgeons often perform 300 to 400 cataract cases a month—more than most ophthalmologists perform in a year. So the incremental benefits of laser-assisted surgery may be very small for the patients we treat. At PCLI, we embrace innovation and often spend considerable time and resources to pioneer advancements that we believe are in the best interest of patients under our care. However, we do not adopt new technology that increases expense, prolongs the procedure, and offers insignificant benefit to the patient—even when doing so could provide a competitive marketing advantage. The question we ask ourselves is, “Do the differences between laser-assisted and conventional cataract surgery result in tangible improvements in safety and visual performance that patients can appreciate?” Our review of the current evidence says, probably not. Femtosecond laser-assisted cataract surgery is new and early studies are undoubtedly affected by the learning curve. We will continue to follow this technology. As more cases are performed, additional evidence will surface. Who knows? In several years, we may enthusiastically embrace laser-assisted cataract surgery. I am following lasers of several manufacturers and want to keep an open mind. If outcomes data show significant improvements over conventional surgery techniques, our thinking could change. We will update you as we learn more. In the meantime, I welcome your comments or questions. Luthe, Rene. “Making the Case for Femto.” Ophthalmology Management 1 Apr. 2013. n. page. Web. 8 Aug. 2013. Trika, et. al., “The Journey to Femtosecond Laser-assisted Cataract Surgery: New Beginnings or a False Dawn?” Eye 2013;27(4): 461-473. Kent, Christopher. “Femto Cataract: Do We Really Need This?” Review of Ophthalmology 5 Apr. 2012. n. page. Web. 8 Aug. 2013.